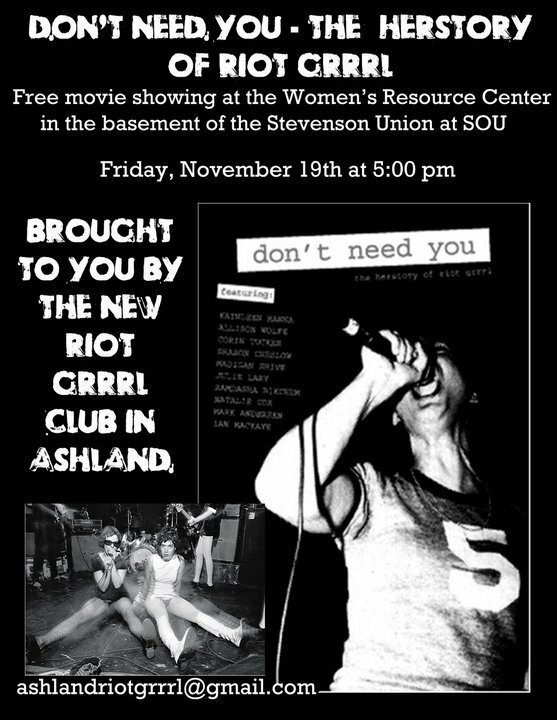 A new club for Riot Grrrls has formed in Ashland by Southern Oregon University students.Â The club, based on an underground feminist movement of the 90â€™s, will hold its second meeting this Friday at the Womenâ€™s Resource Center in the Stevenson Union basement. The film â€œDonâ€™t Need You: The Herstory of Riot Grrrl,â€ a documentary about the history of the movement, will be shown at 5 p.m.
Riot Grrrl is both a music scene and a subculture, emphasizing feminist political activism and art. For more information about the Riot Grrrl club, email ashlandriotgrrrl@gmail.com.